I'd like to introduce you to a couple of people. This is Deus. He lives in Uganda. 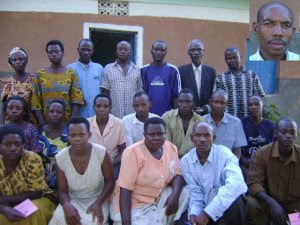 "Deus has recently fully repaid his 700,000 USH loan and is very thankful to the Kiva lenders for their support. Deus has been running a retail shop for 4 years and has had much success, but often would face inventory and stock shortages. The loan allowed for Deus to better stock his shop. Additionally he has begun to carry a new line of soaps that have proven to yield high margins. With the profits from the retail operation, Deus has purchase goats and cattle, thereby increasing his family's wealth. Additionally his children now enjoy regular doctor visits and are in very good health. Deus would like to continue expanding his business and is very optimistic of what the future holds for him and his family." This is Rosalinda, from the Philippines. "Rosalinda Mabunga put up two businesses from her Php 30,000.00 peso loan. She bought additional grocery products, sacks of rice, charcoal and others for her variety store and bought fishing gadgets for her husband to use in fishing. What is important now which pleases the family is that both couple has business of their own to manage. In that way they were able to help one another in raising their family. Today because of the increase in family daily income their standard of living had improved and eases the burden of borrowing money from other people or relatives during inevitable instances. Their income is sufficient enough for the expenses of their children at school and daily consumption and sometimes she was able to deposit excess in her savings account. 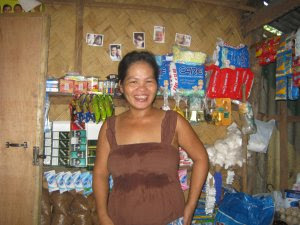 She is so glad for this development in her married life because of the financial assistance from KIVA lenders. To be able to put up a stable business is one great achievement in her life." These are just two people Fabio and I have lent to through Kiva, a micro-financing organisation we've been with for quite a few years now. We, along with a number of other lenders, lent Deus and Rosalinda just $25 each, which was re-paid slowly over a period of months. That money has gone back into financing other businesses, but we could have chosen to take the money back if we'd wanted to. I know I go on about this and maybe you're sick of hearing about it, but there are still poor people in the world and we, by comparison, are still wealthy beyond their wildest dreams. Wouldn't you love to help your own Deus or Rosalinda? So relatively little to us - so huge to your partners.